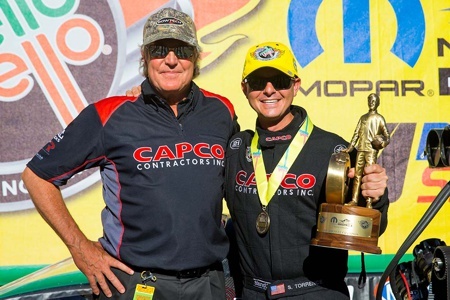 July 26, 2015 -- His back to the wall in pursuit of a starting spot in the NHRA’s Countdown to the Championship, Steve Torrence responded in the manner one would expect of a former world champion Sunday when he drove his Capco Contractors Top Fuel dragster to a dramatic victory in the 36th annual Mopar Mile-High Nationals at Bandimere Speedway. Facing seven-time series champ Tony Schumacher in the final, the 32-year-old cancer survivor overcame a narrow starting line deficit to run down the current points leader at the finish, winning by .001 of a second after covering the 1,000 foot distance in 3.925 seconds at 319.37 mph. It was the first Mello Yello tour victory in more than two years for the Texan and it could not have come at a more opportune time or against a more formidable opponent. After falling out of the Top 10 and facing the prospect of not being in contention for the $500,000 champion’s bonus, Torrence will move on to this week’s 27th Sonoma Nationals in ninth place with only four races remaining before the field is secured for the playoffs. Not only did the victory give Torrence a bit of breathing room in the points race, it also earned him the final guaranteed starting position in the Traxxas Shootout, the eight-car Top Fuel bonus race in which he was runner-up two years ago. The eighth and final starter will be determined by fan vote and lottery. The 2005 World Champion in Top Alcohol Dragster, Torrence had not won a Top Fuel race since June 16, 2013 at Bristol, Tenn., a span of 51 events. It was the fifth win of his pro career and it mercifully brought to an end a frustrating nine-race span during which he failed to advance beyond the second round. It also kept his final round record perfect against Schumacher at 2-0. An avid hunter and outdoorsman, Torrence knew he had a car capable of going the distance on Friday when he posted back-to-back qualifying times of 3.822 seconds, one in each lane. One was quickest of the first session; the other was third quickest of the second. With the car solidly in the show, crew chief Richard Hogan was afforded an opportunity to indulge in a little testing on Saturday. After qualifying No. 4, Torrence unloaded what would be the quickest overall time on race day when he was clocked in 3.891 seconds in a first round victory over Jenna Haddock. He then took out 2014 Rookie-of-the-Year Richie Crampton in round two and beat three-time world champion Larry Dixon in the semifinals to earn a shot at Schumacher.